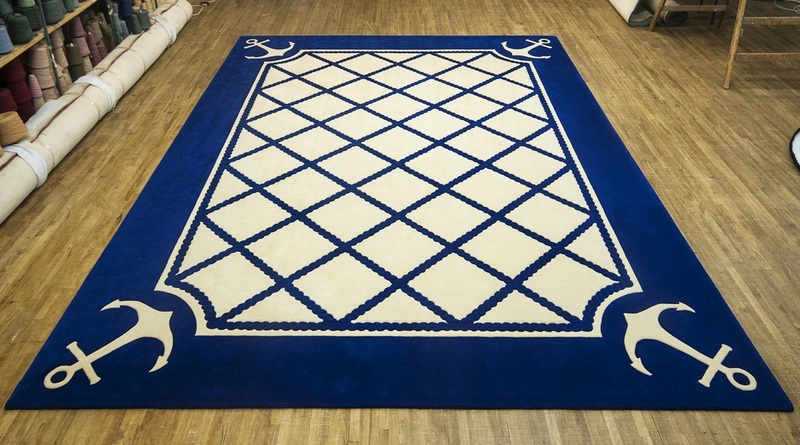 A carpet is hand tufted by a skilled artisan using a large frame. Connemara Carpets has had more than forty years of experience providing durable luxury carpets of the highest quality to clients worldwide. Connemara Carpets offers seamless pieces to fit rooms of any shape and size, with custom measuring and colour-matching services available for a unique addition to the overall design of any project. If you ever get the pleasure of driving on that quiet, scenic stretch of the N59 road on the Wild Atlantic Way between Clifden and Letterfrack in north-west Connemara, you may see a roadside sign that reads ‘Connemara Carpets’. Behind this sign is an amazing story of beauty, grace, and enduring quality: a tale of devotion, perseverance, and belief in the value and durability of outstanding workmanship. When Denis McMurray, founder of McMurray Carpets, first visited Connemara, he fell in love with its rugged beauty and the sense of peaceful isolation it inspired. In the early 1970s, when the McMurray family began making carpets in Connemara, they built a reputation of caring for the customer, giving close attention to detail, and always delivering world-class handmade carpets. The sensational floor coverings, produced by dedicated artisans, were hand tufted using large frames for seamless carpets that are naturally soft, resilient, and durable. They were made to withstand years of heavy wear—some of the original carpets made for hotels are still in situ after four decades. In the old school buildings that were once the centre of the tiny village of Moyard, a new industry was born. Sourcing 100 per cent pure merino wool of the highest quality, spun to their own specification and dyed using ecologically sound methods, the family created a finished product that was natural, sustainable, and luxurious with the highest fire safety rating and an ability to stand the test of time. The company fast became renowned for its opulent creations and was proud to call some of the most prestigious residences and establishments its clients—from Dublin to Dubai and from London to New York and Florida. McMurray Carpets became a thriving industry nestled quietly in the heart of Connemara. Employing a highly skilled local workforce, the factory and showroom provided a much-needed boost to the local economy. The ever-changing landscape and lively local community provided a continuous creative spark for the many unique pieces still scattered throughout the globe today. Densely piled and hand tufted with rich colour, these carpets were and still are the ultimate in natural bespoke luxury, a symbol of grandeur and an investment for the discerning client. McMurray Carpets grace prestigious hotels, castles, corporate headquarters, palaces, and private residences in many countries. Their impressive client list is a tribute to the masterful skill and craftsmanship embodied in every carpet produced. Unfortunately, this level of dedication and passion was not entirely a match for the economic recession which hit Ireland in the 2007–2008 period. The economy both locally and globally was suffering. The prosperous years leading up to this had allowed for many national and international commissioned projects. The company, which had until then been a major employer in its rural community, employing more than twenty local people, was under threat of closure. Staying true to the quality and level of service they had provided up to this point was of vital importance to the survival of the brand. However, maintaining these standards meant losing out to competitive pricing from commercial manufacturers working in lower-cost economies overseas. Realising the detriment of such a closure to Connemara as a whole, a new owner emerged from within the local community. With a strong background in local development, Kieran O’Donohue stepped in to help revive the company and see it through this tough time. His own belief in the importance of retaining the product quality and exceptional standards was the driving force behind the brand’s survival. Using all of the resources available—both personal and public—he began the process of nurturing the business back to life. 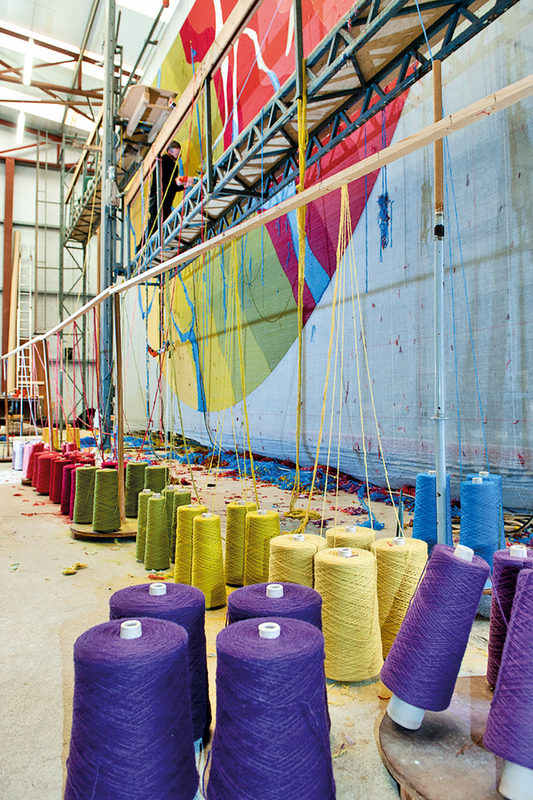 With the cooperation of committed local designers, tufters, and finishers returning in good faith, the new brand, Connemara Carpets, launched early in 2011 with just a handful of staff members. It has gone from strength to strength ever since. They continue the legacy that was gifted to them by the original founders. Over forty-five years since opening its doors, they still pride themselves on the initial principles set out by the McMurray family, from custom design, colour matching, and precise measuring to fitting and delivery. Their design team is led by one of the founding members of the company and his vast knowledge allows them to carry the careful tradition laid down by the McMurrays, while also introducing modern design techniques. Drawing on the creative energy of the Wild Atlantic Way and the ever-changing landscape of Connemara, they stay true to what was the initial driving vision of the brand. Having cultivated relationships with architects and interior designers all over the world, Connemara Carpets works closely with these experts to add an extra flourish to their grand designs. In particular, Carleton Varney, president of Dorothy Draper and Company in New York, utilises the specialist design capabilities and unrivalled colour matching to enhance his own very personal service. He and his company encourage Connemara Carpets to push the boundaries of design and bring his vivid ideas to life. 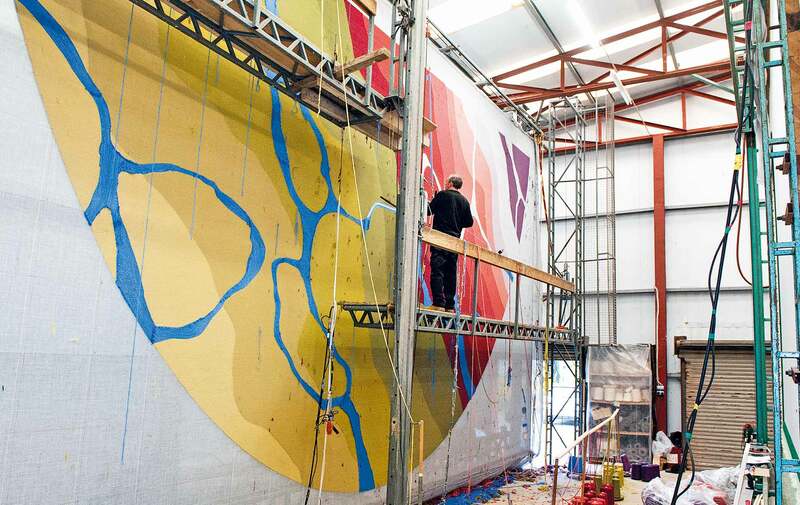 Commissioning pieces for private homes throughout the US and for luxury hotels, his unique eye for quality and his expressive use of colour have produced what some may view as the most intricate and colourful projects to date. The highest quality 100 per cent merino wool is spun to Connemara Carpet’s own specifications and dyed using ecologically sound methods. Ireland has seen somewhat of an economic resurgence in the last two years, and the company is undergoing a period of growth. Larger projects are beginning to emerge as the economy continues to improve. 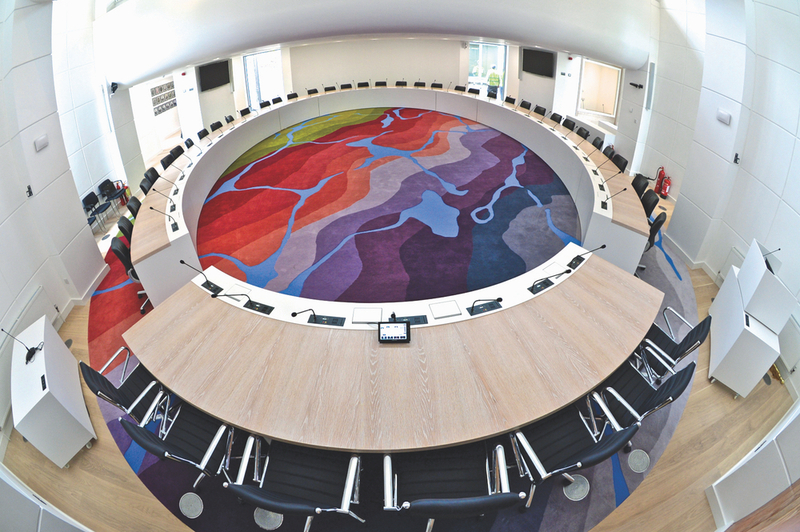 One such project, completed last year, saw one of their biggest seamless pieces—132 square metres (approximately 1420 square feet)—produced for the Galway County Council chamber, and this provided a welcome challenge for both designers and tufters alike. 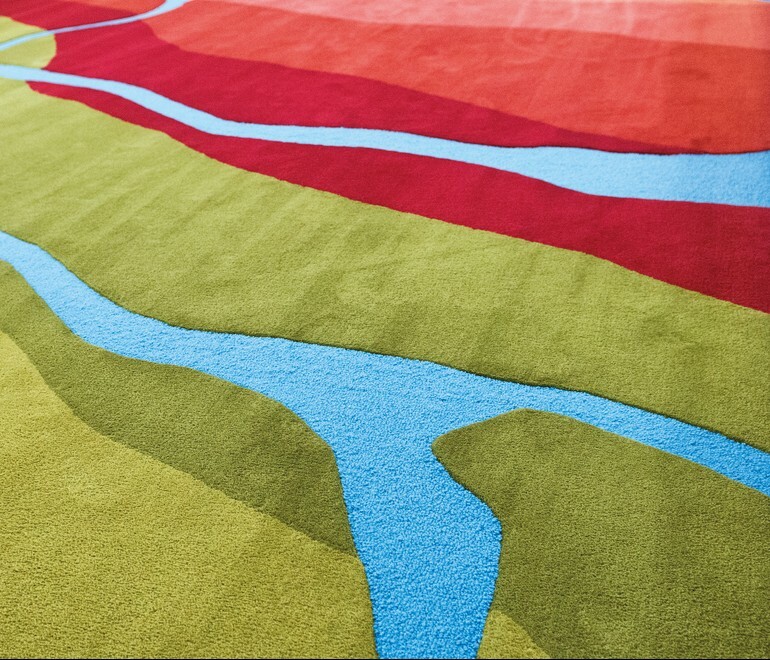 Borrowing its colours directly from the landscape of County Galway and using patterns of the ocean, their team created a carpet that was as impressive in visual terms as it was in size. 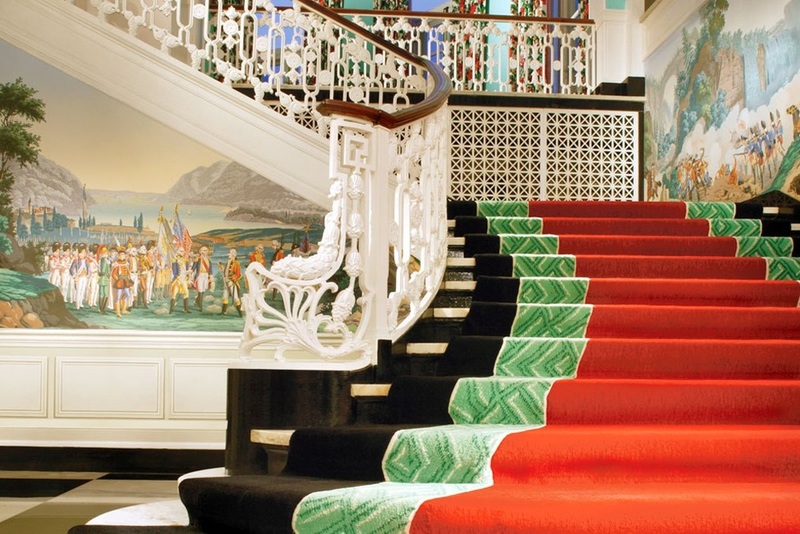 Using more than twenty different colours and tones, the finished carpet was a landmark project which commanded much attention and high praise from local media. Ireland is now also seeing the return of Irish designers who had left due to lack of opportunity. They bring new ideas and approaches. These designers are ready to reinvest themselves in Ireland and in a brand that is rooted in its culture and resources. This will give way to what the company expects will be exciting creative developments in the coming years. Following the long record of exquisite quality and workmanship with infinite possibilities for size, design, and colour, Connemara Carpets remain committed to providing a unique service built on decades of tradition, experience, and, of course, a deep love of the Connemara landscape.